In recent years, the “rights revolution” has exploded in our world. It seems as if every time one watches television or reads a newspaper there is someone demanding a new right. And it also seems that some Christians have transferred the same ideas over to their faith. They presume they have the right to be treated graciously by God. Why do they think this? Is it valid? It may be rooted in the fact that in our sin nature we are sometimes envious and jealous of the grace received by others when such grace is not also extended to us. People believe that it is unfair for such favour to be shown to others and not to themselves. Presuming upon God’s grace can also grow out of lopsided beliefs about Him. The “I only like to think of God as a God of love” kind of thinking usually betrays that outlook. Naturally, it is emotionally more satisfying to think that our God is solely a God of love who is waiting like a divine vending machine to respond quickly and positively to our every prayer, satisfy our every want, and keep us and our loved ones comfortable. Viewing God only as loving without the other truths of God’s character—His justice, His displeasure with sin —results in truth out of balance, or in other words, error. Beliefs determine behaviour. When one believes exclusively that God is gracious, a permissive attitude to sin usually results. We’ve all heard Christians say, “I’m not under law, I’m under grace.” This is often said in the context of questions about their behaviour. The implication is, “I don’t have to be ‘legalistic’ about things because God is a God of grace. Even if I sin, God will forgive me.” It’s the “easier to ask forgiveness than permission” kind of attitude. Paul’s argument in Romans rejects this attitude. “But as people sinned more and more, God’s wonderful grace became more abundant” (5:20), leads logically to the question, “Well then, should we keep on sinning so that God can show us more and more of his wonderful grace?” (6:1). The answer is an emphatic “Of course not! Since we have died to sin, how can we continue to live in it?”(6:2). Later in Romans 11:21-22 Paul wrote, “If God didn't think twice about taking pruning shears to the natural branches, why would he hesitate over you? He wouldn't give it a second thought. Make sure you stay alert to these qualities of gentle kindness and ruthless severity that exist side by side in God—ruthless with the deadwood, gentle with the grafted shoot. But don't presume on this gentleness. The moment you become deadwood, you're out of there” (MSG). The nature of grace means that God doesn’t owe it to us. Grace is simply defined as undeserved favour. As such it cannot be owed; it would cease to be grace. The extension of grace to the undeserving is founded in the nature of the one bestowing the favour, not in the one receiving it. In our case, God shows us favour because of who He is, not because of who we are. A more thorough understanding of salvation indicates that God doesn’t owe us grace. One might ask, “Doesn’t God owe us grace because of what Jesus did in dying on the cross for us?” No. It was a gracious act to send Christ to remove the penalty of sin, but God could have stopped there. He was under no obligation to us to go further and adopt us as His children or give His Spirit to us. 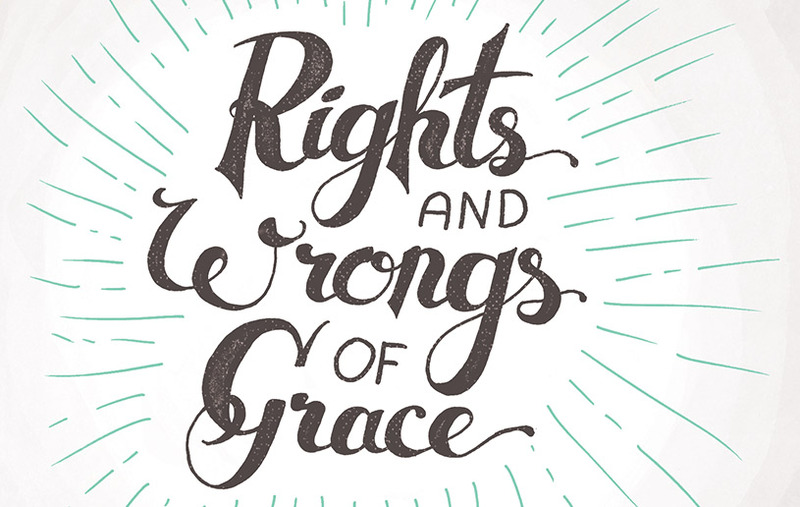 Scripture reveals God’s nature as One who is not under obligation to be gracious. He says, “I will show mercy to anyone I choose, and I will show compassion to anyone I choose” (Exodus 33:19; Romans 9:15). If God had chosen to show grace and mercy to only one person, He would not have been under obligation to show it to anyone else. If you give a gift to someone you are not obligated to give a gift to everyone. It would no longer be a gift, but a duty. Someone once said something that stuck with me, “Anything this side of hell is sheer grace.” That sums it up pretty well. We cannot lay claim to any favour God might show. Yet, how wonderful it is to be treated with mercy and grace! Such treatment should always give rise to a heart of thankfulness and gratitude, not a presumption that it was owed or more is deserved.